In my house in Llanberis, North Wales, i would awake slowly on my days off, go downstairs, roll myself a cigarette and make a cup of tea and then sit on my stool by the back door, watching the dog run around the yard and try to figure out my plans for the day. That was where the problem came in. 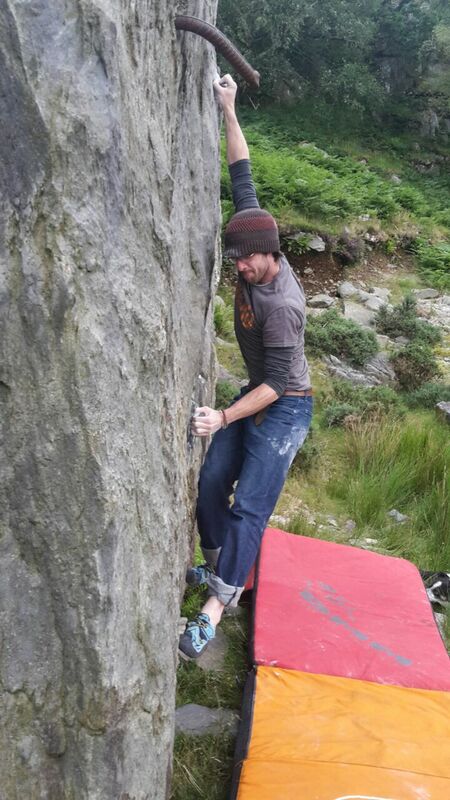 North Wales has a fair amount of bouldering, enough to fit almost any conditions, and with Llanberis at the foothills of the mountains, i had a pretty good idea of where to go to get the best out of my day. The problem is said climbing is spread liberally around the area; making it quite hard to remember all the options in your head. Trying to remember all the problems i was currently working on proved even harder. Whole days have been lost to indecision; my mind not pinning down the right option early enough to actually be able to go. Having to make things up at the last minute often meant i was lacking in company too, and often ended up frequenting the same old places and missing some great new projects. And then, one week, after threatening to do it for such a long time, i got hold of a white board and hung it in the kitchen. I ignored suggestions to put house jobs and shopping lists on there and dedicated it to my projects: climbs that i was currently working on. There has always been a good range, with a wide variety of crags, some sheltered, some very open and a good grade spread too. Basically, a list that would always give me something to go and play on. So, from then on the Sunday/Monday morning (for those are generally my days off) routine would continue as before, but with one crucial difference: as i sat by the back door, i would glance over at the board and then out the door. I’d match the conditions to the crags, pick the best option for the day and then i’d be off. Similarly, when making plans, i now text a photo of The List of True Greatness, as it is currently known, to whoever is keen, giving them the crags as options, if not the problems, often with a recommendation as to which will suit them best. Instead of the dozens of crags North Wales has to offer, instantly we’ve narrowed it down to a dozen. Well, a dozen to begin with. When the list went up back in May, there were 13 lines on there. When i retook the photo the other day, there are now 18, and more crucially, only six lines on both lists. As projects are done, they are rubbed off (a really nice feeling) and replaced by new ones – often by more than one new one… What’s more, the average grade has gone from 7a+ to 7c. Only climbs you have tried may go on the list. It’s not just a wishlist, this is a project list. There must be a variety of venues represented on the List, preferably with only one line at a crag at a time. These are LOCAL problems only – there is not point putting Font problems on there, for example, if you only get there once a year. All climbs must be accessible for a day trip from home. The List MUST be somewhere obvious, not hidden in the shed. The whole point is to get you off your backside so make sure you see it often. Problems cannot be removed from the List until they are completed (or fallen down). I’m not sure about the last one, at the moment, but it’s there as a guide for now. So far i’ve not removed anything unfinished so it can stay with exceptions later if needed. Give it a try, it is very worthwhile and as motivating as anything else i’ve done to date.